This latest figure set from Bronco is something that I have not yet seek kitted. 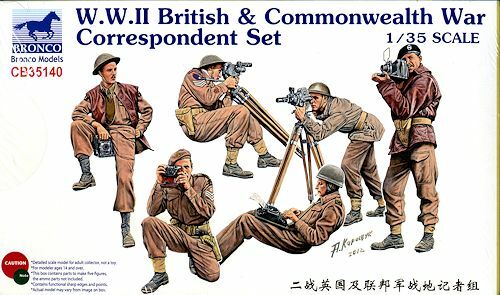 This set includes six different war correspondents in British and Commonwealth uniforms. They are all holding tools of their trade; mostly cameras of some sort. Two have the large format cameras, two have 8mm movie cameras, one has a 35mm camera and one has a typewriter. Some are wearing helmets with the guy typing wearing what looks like a motorcycle helmet. The rest are wearing soft caps. Some of these men are military with the others being from various news services. All come complete with their equipment. erfect for their 1/4 ton 4x4 light truck kits. It includes four figures in various poses, all of them looking rather relaxed as things go. There is a driver, a front seat passenger with his feet up on the windscreen (an officer)(which means you need to model the windscreen folded down), and a couple of guys in the back. These latter two are armed, one with a Thompson and the other with an M1. The guy with the Thompson also is holding a small dog. Like all Bronco figures, these are very well molded with the appropriate clothing for the period. Full building and painting instructions are printed on the back of the box with a number of different paint manufacturers included. Overall, it makes for a most useful set. My thanks to www.dragonmodelsuas.com for the preview set. Get yours today at your local shop or have them order it for you.